Hotel Kilbourne, a quaint boutique hotel in the middle of downtown Sandusky, has all of the charm and accessibility you need for a weekend getaway. This nine-room hotel has breakfast, a chic interior and the most comfortable beds ON EARTH, which is perfect after a long day of tourist attractions, walking and winery visits. Attached to the hotel is a little shop and a hotel bar, as well as a taco joint OH TACO which is in the back of the hotel as well. The perfect set-up for sure. Paper Moon Vineyards: Beginning about 10 years ago with a focus on wine, cider and community, Adam (owner) has begun a family business with his guests best experience in mind. Paper Moon has ‘everything but beer’ with products ranging from dry white wines to full-bodied reds. The owner’s mother is a music education teacher, and since music was always a part of their lives, they named their business after the classic song ‘Paper Moon’. Our fav was definitely their Blackberry Sangria and their hard apple cider (we even bought a 4-pack to bring back)! The vineyard focuses on a chill vibe, where in the winter months, one can visit and drink casually while playing board games and order lunch, to the summer months, having food trucks, clam bakes, and pig roasts with live music! Now that’s how you throw a party--HIGHLY recommend. Vermilion Valley Farm: Being the youngest winery owner in history (obtaining ownership at the age of 22) in the United States in neither Vermilion nor a valley, Joe Juniper brought the beauty of wine and the knowledge behind his work to life during our tasting. 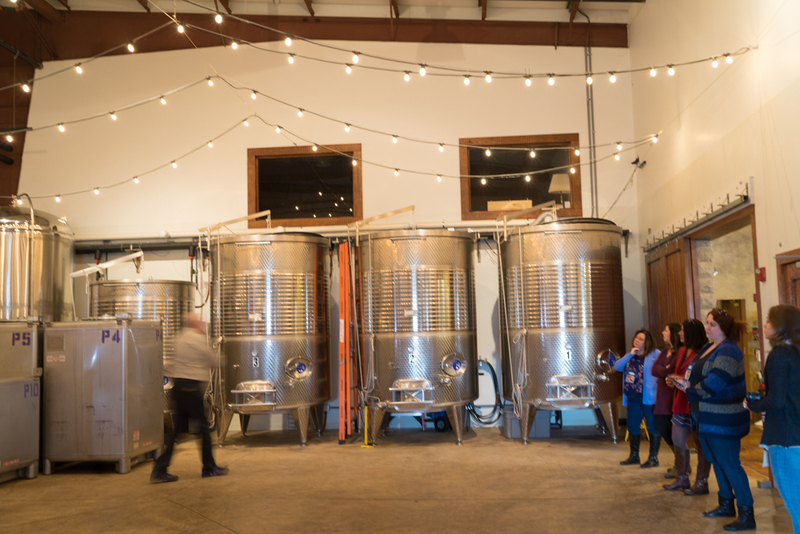 Focusing on drier wines, we got to learn about the process of how climate impacts the grapes, and why Ohio is such a challenging yet rewarding place to call wine-making ‘home’. Even though the Polar Vortex affected many of the crops and flavor of the vintages, we learned how to protect the vines from mother nature (cause she can be a bit rough sometimes) and how to make use of intended styles into a different product. They even throw a big birthday fundraiser for their dog every year to donate to charity! Quarry Hill Orchards: A beautiful three generation farm that started with fruits and vegetables, in recent years they have acquired making wine to add to their large portfolio, nowadays mainly focusing on apples, also growing peaches and cherries. They care deeply about their history and provide an abundant amount of food to the surrounding communities from their harvests. They had a few wine varieties that were all very delicious! I was a big fan of their apple wine. With a gorgeous view of the farm from their hilltop clubhouse, the company was one-of-a-kind and their playful golden retrievers were the cherry on top! Firelands Winery: Here, winemaker Claudio Salvador from Italy, discussed his process of his impressive winemaking and why Ohio was the place to be after he moved from Europe, first stopping in Virginia after entering the states. Our trip to Firelands was not a quick visit--we had copious amounts of incredible food (with about five courses), with two wine pairings per dish, plus one-off reds and grapa to end the night (17%). His wife developed a wine that was a crowd favorite, and we thoroughly enjoyed everyone’s company along with the entire dining experience. Needless to say, we left full, happy, and wine drunk so all was right in the world. The next morning, we needed to recover with some much needed brunch. We we and grabbed breakfast from OH TACO and had some on point breakfast tacos, made with fresh pico de gallo...YUM. We then walked a block over to the segway tours at Sandusky Segwave where Jim (owner) was a pleasure, explaining his history of segways and what it means to him and the community. With the Sandusky bicentennial this year, the segways made a huge part in the celebration and resurgence of their town, bringing a carefree way to blow off some steam! Not gonna lie tho, at first the segway was a bit intimidating, but after a giggle and a near-falling-off experience, it was a breeze. We were honored to be a part of their traditions and history of Sandusky. The next time you say “ew, Ohio” as a small getaway weekend, think again. This place has a lot to offer with great people, culture, wine, a super cute hotel right downtown and activities galore to keep you busy for a weekend, no problem. We hope you choose to visit and enjoy as much as we did! We’ll be venturing down their again very soon!